Haruna (榛名,Haruna) was a Kongō-class battlecruiser laid down by the Kawasaki Shipbuilding Company at Kobe on 16 March 1912, launched on 14 December1913 and completed on 19 April 1915. She was named afterMount Haruna, an active volcano. In World War II Haruna provided distant cover for the Dutch East Indies invasion forces in January and February 1942, sortied into the Indian Ocean against the British Eastern Fleet with the Carrier Striking Force in April 1942, participated in the Battle of Midway in June 1942, the bombardment of the Henderson Field with the Kongo on 13 October 1942, the Battle of Santa Cruz Island on 25 October 1942, the Naval Battle of Guadalcanal, the Battle of the Philippine Sea in June 1944, and the Battle off Samar in October 1944. Haruna was attacked by enemy American carrier aircraft of Task Force 38 and B-24 bombers of the United States Army Air Forces while at Kure on 28 July 1945 and sank at her moorings with the loss of 65 of her crew, was stricken from the Navy List on 20 November 1945 and her hulk raised and broken up in 1946. This is the second large scale battleship produced by Fujimi and as it is in the same class as their earlier Kongo. That being the case, I'll direct you to that preview to see any images of the sprues themselves. Every detail you expect is there, from the casement guns to the myriad of anti-aircraft guns to the main guns themselves, which have brass cast barrels. Two floatplanes are also included with the kit. As another addition, there is a full set of 1/350 sailors in various poses and uniforms. Break out the magnifying lenses when it comes time to paint these, but they will add a huge amount to the overall display of the ship. Many of the parts are designed to be moved. Aside from the main guns, there are gun directors and the rudders which can be placed in different poses. The kit even contains a set of chains for the anchors. Instructions are exceptional and in a very large format. The front and rear covers, both inside and out, have photos of the Haruna during her life time. There are also images of the completed kit as well as the usual Gunze paint reference. Though all is in Japanese, it is not difficult to figure out what goes where as the drawings are superbly done. A full color 1/350 painting diagram is also provided. Apparently the kit is based on her Philippine Sea battles, at least, that is what the instructions seem to say. A small decal sheet for aircraft markings is provided as well as a flag sheet and a plate for the display stand. 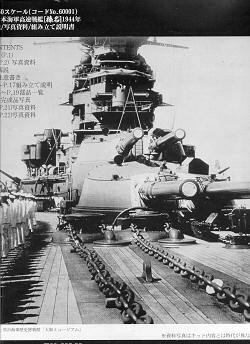 Though it may well be that there is a change in the way that large scale ship kits are designed, this kit and the Kongo have much in common with the basic layout of the Hasegawa Nagato kit, with many of the large structures (like the hull, for instance) having a goodly number of solid braces to prevent any alignment problems later on. TWhile the price of this kit may put some people off, it can be found considerably discounted. If you are a fan of large scale battleships, then this is one that you really need to consider adding to your collection. The detail level is superb and it will provide many, many hours of model building enjoyment. My thanks to www.dragonmodelsusa.com for the preview kit. Get yours today at your local hobby shop or on-line store.With the holiday's coming up, it would make an excellent gift.